Trusted LASIK Surgeons launched its revolutionary Trusted LASIK Surgeons directory service and website at http://www.TrustedLASIKSurgeons.com in order to provide a resource for consumers seeking to improve their vision and find a highly qualified surgeon who can help improve their chances of attaining 20-20 vision. What sets the Trusted LASIK Surgeons directory apart is a unique screening process ensuring that only those who are among the best in LASIK eye surgery and laser eye surgery in the United States are listed. 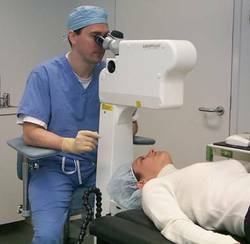 Refractive eye surgeons, such as Dr. Frederick Fraunfelder, are screened based on their experience, research, publications, lectures, and patient care standards. Trusted LASIK Surgeons believes Doctor Fraunfelder's research, teaching, surgical skills, and other professional accomplishments place him among the top LASIK surgeons in the United States. His practice at Casey Vision Correction Center of the Oregon Health & Science University serves Portland, Beaverton, Gresham, Hillsboro, Lake Oswego, and Salem, as well as communities throughout Oregon. LASIK and refractive surgery expert Dr. Rick Fraunfelder of Casey Vision Correction Center in Portland, Oregon, preparing the laser for LASIK eye surgery. Dr. Fraunfelder is a highly qualified LASIK surgeon with proven experience and dedication to helping patients achieve 20-20 vision. Trusted LASIK Surgeons announced today that Frederick Fraunfelder, M.D. has joined the Trusted LASIK Eye Surgeons Directory, an informational resource for consumers searching for highly qualified LASIK and refractive eye surgeons. Dr. Rick Fraunfelder's practice serves patients seeking LASIK eye surgery in Portland, Beaverton, Gresham, Hillsboro, Lake Oswego, and Salem. Dr. Fraunfelder also treats those seeking in vision correction surgery throughout Oregon, and in cities in Washington like Vancouver. Trusted LASIK Surgeons directory service is designed to feature only those LASIK eye surgeons who are among the best in the United States. To accomplish this, Trusted LASIK Surgeons screens each laser eye surgeon based on experience, premier patient care, and professional credentials. In Trusted LASIK Surgeon's opinion, Dr. Fraunfelder's outstanding achievements place him among the top LASIK and vision correction surgeons in the United States. The most significant professional qualifications that set Dr. Rick Fraunfelder apart from nearly all other LASIK Surgeons are his experience as a principal investigator for an FDA study for Nidek and member of the FDA Ophthalmic Devices panel study, his academic appointment at Casey Eye Institute, and his extensive research. At the Casey Eye Institute at Oregon Health & Science University, Dr. Fraunfelder serves as an as a Associate Professor of Ophthalmology, Cornea/External Disease, Ocular Oncology, and the Refractive Surgery Director of the Cornea/ External Disease/Refractive Surgery Division. Dr. Fraunfelder is also a leading expert in medication side effects and interactions. He directs the National Registry of Drug-Induced Ocular Side Effects, which is the only database designed to gather data on the side effects of drugs on the eye, and regularly teaches and lectures his peers on the side effects of medications on the eye. Dr. Rick Fraunfelder serves on several editorial boards, including Drugs of Today, EyeNet, Drugs of the Future, and the Physicians Desk Reference. He also is a reviewer of articles for over 10 scientific journals related to eye care including the American Journal of Ophthalmology, Archives of Ophthalmology, Cornea, and the Journal of Refractive Surgery. Dr. Fraunfelder is extensively published, with over 62 peer-reviewed scientific journal articles published, 26 text book chapters, and 3 books to his credit. He has presented over 12 lectures on research topics at major eye meetings in the United States and internationally and over 25 lectures at local and regional meetings to fellow eye doctors. These collective accomplishments have earned him the respect of his peers world-wide. Over his career, Dr. Fraunfelder has performed over 5,000 LASIK and laser vision surgery procedures. With over 10 years of experience in refractive surgery including laser vision surgery procedures like LASIK and PRK, Dr. Fraunfelder has the proven know-how to provide patients with the highest eye care available when it comes to their vision correction. Rick Fraunfelder, M.D., performs LASIK and other laser vision and refractive surgery procedures on patients with nearsightedness (myopia), farsightedness (hyperopia), astigmatism (blurred vision), and presbyopia. Dr. Fraunfelder's practice, at Casey Vision Correction Center, provides premier patient care, including "All-Laser" or "Bladeless" LASIK and use of Wavefront Based ("Optimized") LASIK and PRK. Dr. Fraunfelder offers not just LASIK and PRK (laser eye surgery procedures), but limbal relaxing incisions and cataract lens implant procedures to give patients a full range of options when it comes to choosing the right vision correction procedure. Dr. Fraunfelder has also helped new patients who have had significant problems with LASIK or other vision correction procedures performed by another surgeon. Moreover, Dr. Fraunfelder has been selected by other eye surgeons, optometrists, opticians, employees of companies that specialize in refractive surgery instrumentation or their family members to perform their LASIK or other refractive surgery procedure. Certified by the American Board of Ophthalmology, this highly qualified refractive eye surgery specialist is a recipient of an Achievement Award by the American Academy of Ophthalmology. He is also an active member of the International Society of Refractive Surgery, the American Society of Cataract and Refractive Surgery, and numerous other international and national professional organizations dedicated to eye care. Locally, Dr. Fraunfelder is a member of the Oregon Academy of Ophthalmology and the Oregon Medical Association. Dr. Fraunfelder is also dedicated to helping others less fortunate. His charitable contributions extend from local schools and the Lions Bank of Oregon, where he serves on the Medical Advisory Committee, to Orphans Over Seas, a charity which helps children and single parents all over the world. "We are honored to have Dr. Fraunfelder join our Trusted Lasik Directory. The Casey Eye Institute has a long history of contributions to the field of refractive surgery beginning with the excimer laser FDA studies initiated by Dr. Larry Rich in the early 1990's. Rick Fraunfelder continues this strong tradition. He also brings the unique perspective of serving on the FDA advisory panel which oversees the approval of ophthalmic laser systems," commented James J. Salz, M.D., Chief Executive Officer of Trusted LASIK Surgeons. "Eyesight is a precious gift. I am fortunate to practice in a field that permits me with an opportunity to help patients attain better vision" said Rick Fraunfelder, M.D., Associate Professor of Ophthalmology of Casey Eye Institute. "The Trusted LASIK Surgeons website attracts patients who are looking to find a LASIK specialist who has professional qualifications that exceed those of the typical LASIK doctor. I am honored to be included among the highly distinguished group of surgeons listed at the Trusted LASIK Surgeons"
The screening process and standards used by Trusted LASIK Surgeons are located at How Are LASIK Eye Surgeons Qualified at Trusted LASIK Surgeons? At Casey Eye Institute, the mission is simple: to provide excellent eye care in a quality, cost-effective environment that combines education, research, clinical leadership and service to the community. The Casey Eye Institute is an academic regional eye center dedicated to preventing blindness through research, and to bringing advanced technology to the Pacific Northwest through continuing education of physicians. We are also committed to affordable eye care through collaborative programs and to sharing resources with community providers. Casey Eye Institute is the only free-standing academic eye research center west of Salt Lake City and north of San Francisco. For more information about the Casey Eye Institute, please visit http://www.ohsucasey.com. Trusted LASIK SurgeonsAn online resource for consumers seeking better vision through LASIK and other refractive surgery procedures. Portland LASIK Surgeon Rick FraunfelderLASIK surgeon and expert Dr. Rick Fraunfelder has extensive qualifications that we estimate place him among the top refractive eye surgeons in the United States. Dr. Fraunfelder offers a full range of vision correction surgery options, including laser eye surgery and lens implants.